We're not sure who would want to wear a dingy checkered outfit like this, but we can imagine plenty of characters who would have a hard time taking it off! Some of them are more obvious, like the embattled fan: a young man grown old who swore that he would never let disco die, even though the local club shut down or moved on to the next pop music fad a couple of decades ago. 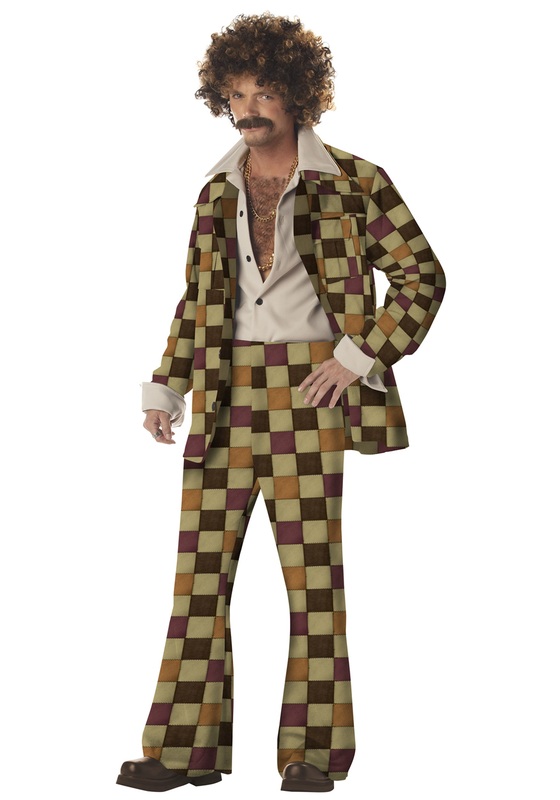 Now, he doesn't have the heart (or the wardrobe) to take off his lucky leisure suit—not when he risks missing one last chance to relive the mirror-balled glory of a youth spent on the dancefloor! Then there's the type who's waaaaay undercover: when he got this assignment, it was just another job. Now he honestly can't remember whether he owns this bowling alley or not, and who he's working for, if anybody. But he's not going to blow this operation just because he has a few questions for his superiors—if they even exist! He's just gonna keep fixing the automatic pinsetter and watching for anything out of the ordinary. And there's always the choose your own funky adventure: when you take a wacky look like this and run with it, shamelessly mixing and matching in whatever hilarious accessories strike your fancy. It might be hard to pitch to a room full of studio executives, but sometimes you just have to march to your own boogie beat! I bought this outfit for my Dad for my Birthday Party. It looked great on him and the measurements were accurate. I was very pleased!! !